As Illinois’ child welfare agency works to clear out its remaining patients at a Chicago psychiatric hospital beset by allegations of sexual abuse and assault, problems continue to emerge. The Illinois Department of Children and Family Services on Monday opened an investigation into a 9-year-old girl’s allegation that a staff member at Aurora Chicago Lakeshore Hospital choked and restrained her. The girl did not have any bruises or marks, DCFS officials said, and the employee is not currently working on the unit. The report brings the number of DCFS investigations into allegations of abuse or neglect at the hospital to 19 since January. The girl, who reportedly was provoking other children on the unit before the incident, has been hospitalized at Lakeshore for nearly two months. She was cleared for discharge two weeks ago but remains at the hospital because DCFS has not found her a place to go once she is released. 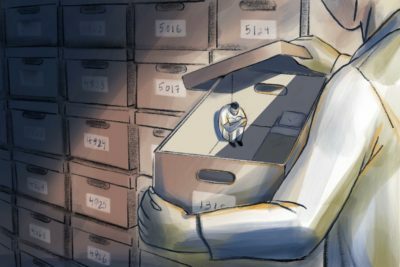 A ProPublica Illinois investigation this year documented what happens to the hundreds of children in state care who spend weeks and months waiting for DCFS to find them a more appropriate placement. DCFS staff have been stationed at Lakeshore for round-the-clock observation of children in the department’s care since Saturday. The agency plans to continue the monitoring at least until the last of its charges there move out, DCFS lawyers told a federal judge at a hearing on Tuesday. It marked the second time in less than a week that DCFS appeared in front of U.S. District Judge Jorge Alonso to explain what the department is doing to protect the children in its care at the hospital. DCFS attorneys said the employees doing the monitoring are experienced professionals but acknowledged the strain of continually overseeing the hospital. At Tuesday’s hearing, the ACLU blasted the agency for providing little or no information on matters the group said were key to the children’s safety. ACLU lawyers argued that the DCFS employees doing the monitoring should have training, clinical experience and knowledge of psychiatric hospitalizations. Dalenberg was referring to an allegation this month in which two patients, a 14-year-old male and a 16-year-old transgender female, fondled each other under a blanket in a hospital day room while a staff member was present. The ACLU lawyers also wanted broader access and authority for the court-appointed expert and the University of Illinois at Chicago psychiatrists who will work with DCFS on transferring the remaining dozen or so patients out of the hospital. Lakeshore CEO David Fletcher-Janzen said the health and safety of the patients is the hospital’s top priority. Children who are in the custody of DCFS often face the most difficult challenges, he said. DCFS relies heavily on Lakeshore to treat children with severe mental health issues. Last year, 41 percent of the roughly 1,100 children and adolescent patients treated at Lakeshore were in DCFS care, court filings show. Cook County Acting Public Guardian Charles Golbert said his office represents the majority of the roughly 1,200 children in DCFS care who require hospitalization each year. As of Monday, 10 children at Lakeshore were clients of the public guardian’s office, which filed a flurry of emergency motions in juvenile court asking DCFS to provide detailed and updated reports on each of those children. Both DCFS and the ACLU recommended that Dr. Michael Naylor, director of the behavioral health and welfare program at UIC, weigh in on where children leaving Lakeshore should be placed, although the groups disagreed on the extent of his role. Children in DCFS’ care have a history of trauma that can worsen with time in an institution, Naylor said. In assessing the care of those children, he said, it’s important to consider whether there are larger, systemic issues at play. When a child languishes in a psychiatric hospital for longer than is deemed medically necessary, their behavior often deteriorates. Five of the 12 DCFS patients that remained at Lakeshore as of Tuesday morning had been cleared for release and were waiting on the agency to find them placements. Sometimes, even when DCFS finds new placements for children and teenagers at Lakeshore, the transition poses complications. A 17-year-old who was discharged from Lakeshore on Monday ran away before DCFS could transfer him to a facility some 300 miles away near the Missouri border, according to agency officials. The teen was walking down an alleyway toward the car DCFS was going to use to drive him to his new placement when he suddenly dropped his bag and bolted. The caseworker ran into the hospital and called the police, hospital officials said. A source with knowledge of the incident said the teen was upset about being sent to a residential treatment facility far from home. As of Tuesday afternoon, he still was missing. DCFS asked a judge in Champaign County, where the teen is from, to issue a warrant to find him but instructed that he not be held in detention if located.